What the Hell Is This Russian Olympic Pistol Shooter Wearing? Well, we didn't expect to see cybernetics at the Olympics until at least 2020, but that just shows what we know! 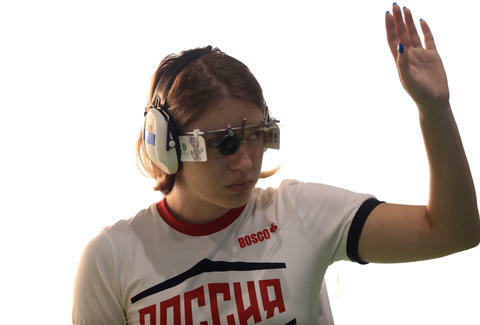 Jokes, aside, this Russian sharp shooter's name is Vitalina Batsarashkina, and while her Olympic-level glasses may mystify you, they're actually pretty common when it comes to blowing away the competition in the pistol shooting events at Rio this year. Just look how happy this dude is to be wearing his. The glasses aren't a fashion statement as much as they are a corrective for the natural deception your eyes pull when you try to hit targets at a distance. Sharpshooting at the Olympics means using your gun's front and rear sights to line up with the target -- and doing so quickly and instinctively. The alignment of your arm and your breathing all factor into the process, but seeing the target accurately is probably your first concern. As experienced Olympic gunsmith Scott Pilkington put it to Wired: "The ability to hit the target is your ability to correctly hold those two alignments points up against the target." These glasses, equipped with a lens, blinders, and mechanical irises, help you do that in one neat and tidy robotic-looking package. They're all the rage with Olympic shooters like Russia's Batsarashkina (who wears blinders with doodles on them) and Greece's Anna Korakaki (who won the gold medal for the women's 25m pistol event). Just like a visual field test at the optometrist or any other eye exam, the blinders help you focus with one eye. You can't trust both of them together, so your eye doctor covers one up to allow the other to do the hard work of focusing on the target, testing one against the other. Olympic shooters who use these want to cover one eye with blinders, or darken it so that they can focus with the other eye more readily. Additionally, the mechanical irises contract and expand depending on how much light you want in your eyes, just like the aperture on a camera lens. On any camera -- most apparent on those DSLR cameras with detachable lenses -- using lenses with larger apertures, like f/1.4 or f/2.8, will result in soft-focus backgrounds (or shallow depth-of-field). Sometimes a photographer or cinematographer might want to create that effect, with a face or a subject in sharp focus and the background a wash of haze. Opening your aperture that wide will also result in a much brighter field of view. The opposite is true for a sharpshooter. The smaller the aperture, the deeper the depth of field, and the farther the sharpshooter can see with accuracy. As the Wired story explains, they want both their gun sights and their target in as sharp a focus as possible immediately within the brief seconds they have to aim, pull the trigger, and hit the target. Some fools have called them "incredibly dorky," but we're willing to bet they haven't won any gold medals. That said, they could cost you upwards of $500. Eric Vilas-Boas has shot many photos in his life, but no guns. Follow him on Twitter.